The sheer scale of indiscriminate destructive power represented by nuclear weapons such as Trident was only justifiable, if at all, by appeal to the principle of mutually assured destruction. For many, including many Christians, that in itself was a deeply problematic argument, although there were also many who were prepared to live with the strategy because it appeared to secure peace and save lives. Shifts in the global strategic realities mean that the traditional arguments for nuclear deterrence need re-examining. The presence of such destructive capacity pulls against any international sense of shared community. But such is the talismanic power of nuclear weaponry that few politicians seem willing to trust the electorate with a real debate about the military capacity we need in the world of today. In calling for a “real debate”, they mean, of course, one inclined toward nuclear freedom, or, rather, freedom from Trident (they had previously referred to the “nuclear family” and the need to extend beyond it, so the whole Letter is essentially a nuclear-free zone). When they say that Britain’s nuclear deterrence “needs re-examining”, they mean abolishing, which is the likely price the SNP will exact from Labour as compensation for making Ed Miliband Prime Minister. 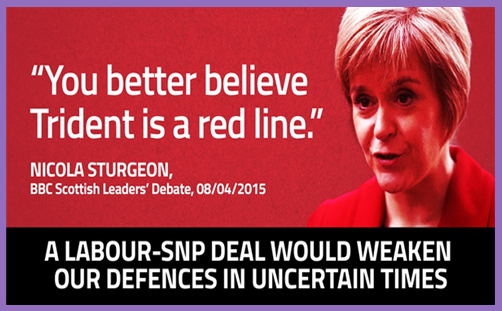 It is, apparently, a ‘red-line issue’ for the SNP: Nicola Sturgeon obviously doesn’t believe that an Iranian nuke is likely to fall on Edinburgh. Meanwhile, David Cameron has just committed the Conservatives to building four new nuclear submarines, at an estimated cost of £20bn (opponents say £100bn, so there’s a slight budgetary discrepancy). So (unusually in this humdrum age of Red Tory / Blue Labour / everyone’s-really-a-LibDem pursuit of the centre ground) we have a real choice on defence (a topic which no one is really talking about). A Labour/SNP (/Sinn Fein?) coalition is likely to abolish Trident. A Conservative/Ukip (/DUP?) coalition is pledged not only to retain but renew it. No prizes for guessing the Bishops’ preference. But what about another Conservative/LibDem coalition? We will strive for global nuclear disarmament, showing leadership by committing not to replace the Trident nuclear weapons system on a like-for-like basis.. At a cost of £100 billion over a lifetime it is unaffordable, and Britain’s security would be better served by alternatives. Which must be music to itching episcopal ears, because David Cameron isn’t likely to make his commitment to renew Trident a ‘red-line issue’, and a LibDem appeal to the monumental £20-100bn cost in an age of fiscal austerity is likely to win the day in any post-election negotiations. So you end up phasing out Britain’s nuclear deterrent without any “real debate” at all. But there is a debate to be had, and since the Bishops have called for one, let’s have it. Trident is the price we pay not only for peace and national security, but for the contribution Britain makes to the security of the world. Our seat on the UN Security Council is contingent on our nuclear potency, which the SNP may not care very much about, but they will if President Putin keeps making incursions into Scottish airspace. And it’s not only Russia: there’s also North Korea, and President Obama has just gifted the eschatological ayatollahs of Iran the means of ushering in the Mahdi and wiping Israel off the map. There is denial that this deal will do anything of the sort. But an assurance that Iran will open up their nuclear programme to inspection and not make a bomb for 10-13 years is no assurance of anything at all. When you believe you have a prophetic role to play in ushering in the End Times and the Second Coming of Isa, a decade-long delay is as a few minutes in the quest to reestablish Allah’s kingdom of righteousness. There is no ‘Christian’ approach to nuclear deterrence: Jesus would no more bless a Trident submarine than He would a fruitless fig tree. And it’s hard to square a nuclear bomb with the Just War theory on the grounds of proportionality alone, let alone the collateral incineration of civilians. There is no jus post bellum after a nuclear strike: you’re dealing with the fallout (quite literally) for decades if not centuries. But Jesus said, ‘Blessed are the peacemakers: for they shall be called the children of God.’ And Trident helped to establish international treaties of concord throughout the Cold War era, even if that peace was sometimes hot. How would a nuclear-free Scotland defend herself against a nuclear aggressor? The answer, of course, as that an independent Scotland would seek to lean on England’s deterrent, and would do so without contributing a penny toward the cost. While they’re busy educating their youth FOC, investing in infrastructure, looking after their elderly without charge and issuing free prescriptions, the English would foot the bill for Scottish defence. But if it is in the British interest to deter war (and Trident, let us remember, is a proven deterrent), it is incumbent upon all peacemakers to support it, not least because £20bn is cheaper than fighting a conventional war; it saves lives; and is less than half the projected cost of HS2. If the Bishops wish to engage in a “real debate”, let it be a full and frank discussion with detailed scrutiny of both the costs and benefits of replacing and updating our nuclear deterrent. It is silly to talk in terms which seek to offset the billions spent on nuclear submarines against the cost of training teachers or running foodbanks: if a man does not live in peace and security, he shall neither learn nor eat. Trident is expensive, but insofar as it is a non-violent symbol of national resistance, it ought to be tolerated as one of those irritating lesser evils. England cannot coerce an unwilling Scotland into a power struggle on the virtues of moral armament, but we can make an appeal for mutuality and responsibility. The nuclear deterrent is actually part of the pacifist’s arsenal: by demonstrating against it, they helpfully point people toward consideration of the moral issues. The fact that the SNP, LibDems and the House of Bishops all oppose renewing Trident is not proof of any moral good or ethical superiority, but of the need for peacemakers to protest even louder the wrongness of those who protest against it. No one can envisage a scenario where the use of nuclear weapons would be an appropriate or justifiable offensive action, but as a means of defence it passes all tests of necessity. Trident limits violence, death and destruction by mitigating the likelihood of armed conflict. This is a universal moral achievement. Ever since the United States used atomic weapons against Japanese noncombatants in World War II, we have found reason to justify the slaughter of innocents in the pursuit of unconditional surrender and the saving of our own lives. Christians are not called to be defenceless: a wise and righteous leader will always seek to avoid violence in conflict. But only a foolish one would ignore the imminent threat to world peace in an uncertain context of ascendant Shia eschatological hostility.